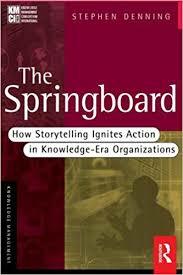 The Springboard is an early book about storytelling as a tool within the KM discipline. I'm sure there were lots of books about storytelling before that but it's THE book that raised the idea that knowledge management could be significantly boosted by leveraging the power of narratives. There have been a few other books on the subject since then and the latest on my shelves is Putting Stories to Work, by Shawn Callahan. This newer book has a broader focus on business storytelling and doesn't focus on the knowledge management applications but all the principles are the same. In fact, I find that a broader business perspective is often necessary to effectively address challenges that are initially perceived as "KM challenges". The KM challenges don't become challenges in a vacuum. They are challenges within a business environment, and organizational culture that is likely to affect all aspects of the organization. Question: Is it lunacy to tackle KM challenges without recognizing and addressing broader organizational issues? Corollary question: As a solo consultant, how much can I realistically tackle? Personal Experience: I've tried my hand at storytelling. I've taken a couple of classes on the topic, I did a full series of storytelling talks through Toastmasters, and I'm still working on it. In a few weeks, I'll be doing a presentation that has a storytelling feel to it. I'll see if I can strengthen that element to make it more interesting. I have written elsewhere about the use of didactic fiction and I've experimented a lot with that, to the point of writing an entire novel that was meant to be didactic. Interestingly, Steve Denning followed this storytelling book with a piece of didactic fiction titled Squirrel Inc.: A Fable of Leadership Through Storytelling. Case studies (fictional or not) are probably an easier way to convey key insights. Keep a record of "KM stories" based on my own experiences. Create a special section (and tag) in my internal consulting wiki. Explore how I treats stories when I consume them. When reading new books, make a note of how stories are used to illustrate a point. Do I typically read the stories or skip them to get to the point? Is it like overly detailed descriptions in novels that I skip to get to the action? Or do they really add value?